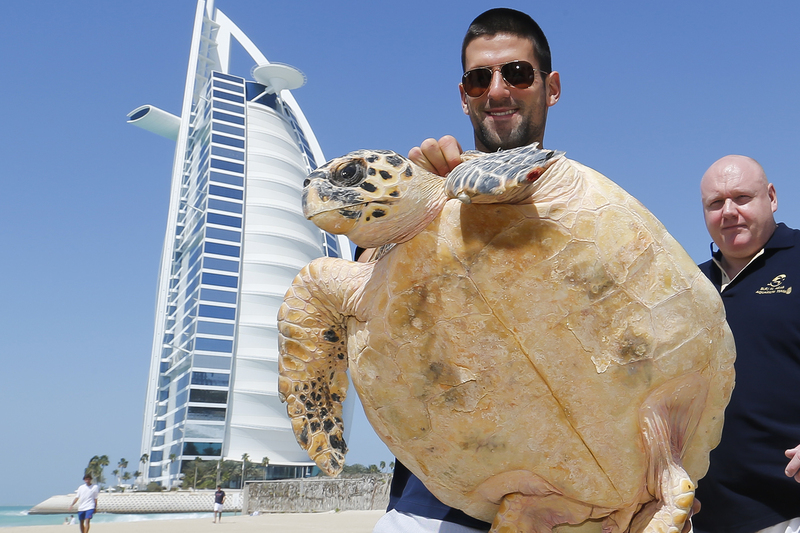 Leonardo the sea turtle, named by world tennis champ Novak Djokovic, has been released back into Dubai waters after recovering at the luxurious Burj Al Arab hotel. Leonardo and four other hawksbill sea turtles were released Wednesday morning after recovering under the Burj Al Arab-based Dubai Turtle Rehabilitation Project (DTRP). 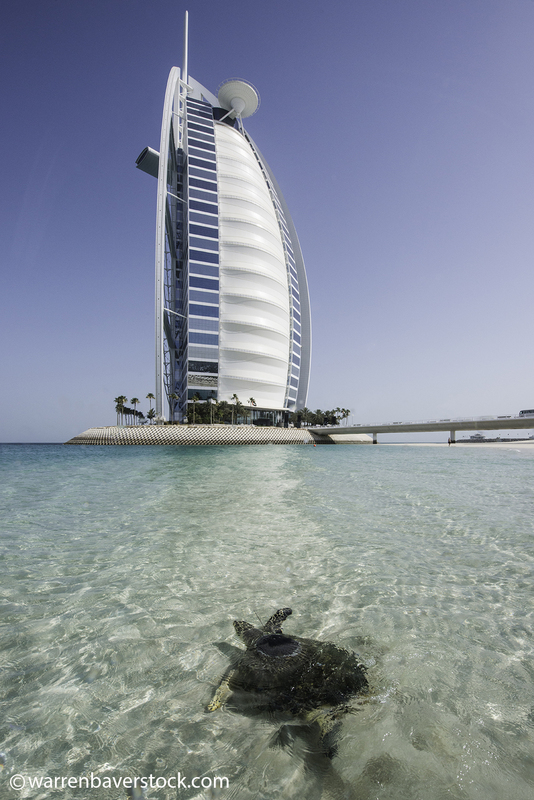 Cheered on by guests and colleagues of the Jumeirah Group, the turtles slipped into the warm sea after a short waddle on the sun-kissed beach. 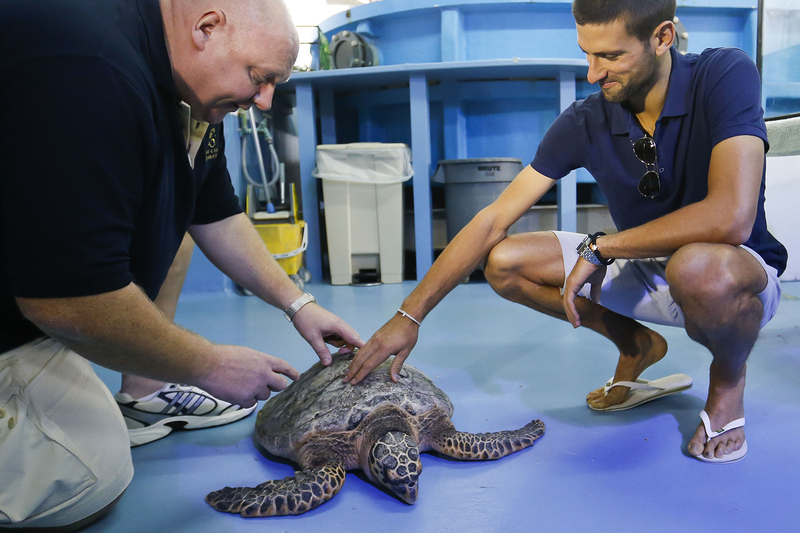 Leonardo had been rescued by the Emirates Marine Environmental Group (EMEG) and was suffering from severe debilitation, said Warren Baverstock, Aquarium Operations Manager, Burj Al Arab. “When he arrived (eight months ago) he was 17kg and upon departure this morning his weight was 30kg,” Baverstock said. “Like many of the sea turtles that are brought to us, Leonardo was suffering from impaction caused from eating some plastic debris which was floating around in the sea. 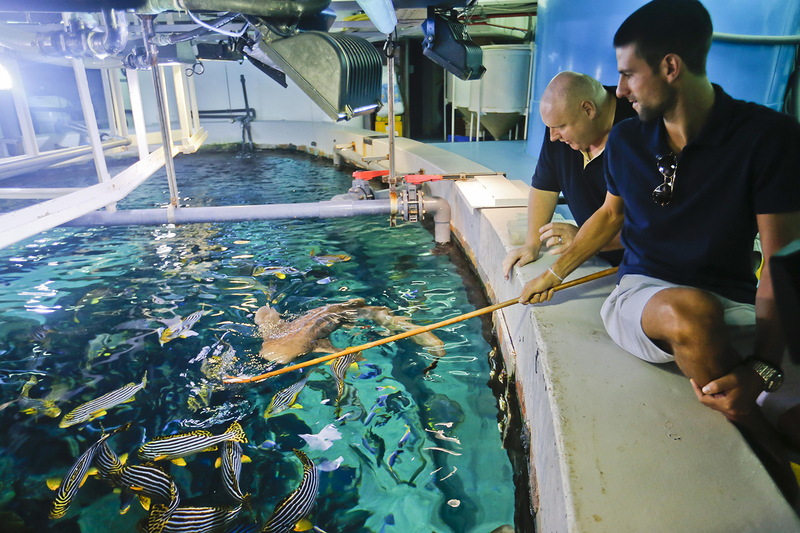 The rehabilitation team worked very hard to keep Leonardo alive by having to regularly force feed him. “Eventually he started to eat by himself and gradually built his strength back up, which is when Novak met him… We had four other hawksbill sea turtles that had the green light to be released after they were given a clean bill of health.” Leonardo, thought to be around 20 years old, is a critically endangered sea turtle – only 8,000 nesting females are left in his species. Sick and injured turtles are handed over to the DTRP, at times by ordinary residents, but mostly rescued by the EMEG. DTRP has been running in its current form since 2004 and has so far seen the release of over 550 rescued sea turtles back into Dubai waters. It is run in collaboration with Dubai’s Wildlife Protection Office, with essential veterinary support provided by the Dubai Falcon Hospital and the Central Veterinary Research Laboratory. In 2011 alone over 350 sick or injured sea turtles have been treated by the DTRP after being washed up on the regions beaches. The DTRP is currently the only project of its kind in the Middle East and Red Sea region.